This one is a recipe of necessity: my CSA veggie boxes have taken over the fridge! The counters, the fridge…everywhere I look there are veggies that need a home: in our BELLEHS. It also didn’t help that I spent part of the evening Sunday night trying to figure out which potatoes survived the house turning into a fridge for a few days (the answer: NOT the new potatoes or the red potatoes, sadly). We also have a week coming up where generating leftovers is a bad idea. Thus, many of the items in this dish came from our CSA veggie boxes, specifically: the onions, sweet potatoes, apples, carrots and honey. The bulk of the prep time in this dish, well – ALL of the prep time, really, came from the chopping that takes up steps 1-5, below. The rest of it is about a 5 minute process. So, if you want to do any of this the night before, I’d recommend going for it. The carrots were cut up in the morning too, only because I was out of energy by the time I was done with a long day that I capped off with prepping onions, potatoes, shallots and apples for the next morning. And, really, if your fear is that the apples might turn brown as they oxidize: feel free to let go of that fear. First, if you have the lid on your container fairly tight, that problem may be minimized. Second, if they’re going in the crock pot, you’ll never notice whether they turned brown overnight or not. This dish came out sweet and yummy. We didn’t pair it with a starch, but you certainly could serve this with some rice or couscous. The sauce is plentiful and light in nature, and it lends a nice sweetness to the whole thing. Because we let it go for longer than the required cook time, the pork just fell apart on us (never a bad thing), and both the sweet potatoes and apples just fell apart on the tongue. Again, this is a good problem to have. I would say that this is a recipe that could easily be done with chicken instead of pork BUT I would then adjust the cook time down to 6-8 hrs. 1. Peel and thinly slice the onion(s); place in the bottom of a 5qt oval crock pot in a single layer. They should cover the majority of the bottom of the crock pot. 2. Wash and chop the sweet potatoes into pieces no more than about 1/2″ thick and 1″ wide. Place the sweet potatoes in the crock pot. 3. Peel and mince the shallot. Sprinkle about one-third of the shallot on top of the sweet potatoes. 4. Peel the carrots and remove the ends; chop into small rounds, no more than about 1/3″ thick. Place in the crock pot. Sprinkle about one-third of the shallots on top of the carrots. 5. Wash the apples; slice in half, remove the core and then cut the apples into roughly 12 slices. Place the apples in the crock pot; sprinkle the remaining shallots on top of the apples. 6. Place the pork tenderloin on top of the apples. Pour the broth on top of the tenderloin and pour around it, on top of the apples and veggies. 7. In a measuring cup, pour the apple juice and the cider vinegar; pour this combination on top of the tenderloin and then around it, on top of the apples and veggies. 8. Drizzle the honey on top of the tenderloin, using either the flat of the spoon or a brush to coat the top of the tenderloin evenly with the honey. 9. Sprinkle brown sugar on top of the tenderloin. 10. Cover and cook on LOW for 8-10 hrs. 11. 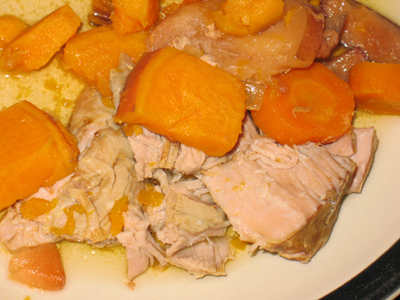 Remove pork from crock pot and cut into 1/2″ thick pieces before serving with veggies, apples & sauce. This entry was posted in crock pot cooking, entrees, locavore and tagged crock pot, crockpot, CSA, eat local, locavore, meal planning, meals, pork tenderloin, vegetables by crunchymetromom. Bookmark the permalink. I adore tenderloin – it has such an amazing flavour and texture if cooked properly. You seem to have done this very well. Thanks!! Our favorite way to prepare pork tenderloin is actually by grilling it after applying Penzeys Bicentennial Rub (http://www.penzeys.com/cgi-bin/penzeys/p-penzeysbicentennial.html). It’s a GLORIOUS way to enjoy tenderloin.